Welcome to the October country – Giveaway (Or “I wanna be Ray Bradbury”) | Marie Loughin's "I WANNA BE . . ."
← Marie Meets the Publishing Industry: Do I wanna be a publisher? It makes perfect sense that Halloween should come at the end of October, the month when our gardens die and the birds flee. When we shiver in our last breath of sunlit air before scurrying into our caves to watch football and dream of Christmas. What better time to celebrate all that is scary than the birth month of skeleton trees that will rattle our windowpanes in the dark of January? And who celebrates this eeriest of months better than Ray Bradbury? In particular, no book captures the mood and spirit of Halloween better than Ray Bradbury’s Something Wicked This Way Comes, a tale of two boys caught by the mysteries of Cooger & Dark’s Pandemonium Shadow Show. It’s a story of choices, of the pull of darkness against the light. Of the dangers of always looking ahead…or always looking back. This is not an action book. You don’t turn the page to see what happens next. You turn the page to soak it in, to live the eerie October days of another time, when boys ran free at night and the only monsters were of the supernatural kind. You turn the page to see Jim Nightshade teeter on the edge and to teeter along with him, the tingle of danger dancing along your spine. And so, in celebration of the October country, where dark things dwell in shadows, I offer you, dear Reader, a trade. Share a Halloween memory with me via a comment on this post. If your story is too long, then post it at your own blog and copy the link to a comment here. Or, lacking a blog, you can e-mail your story to me (marieloughin@gmail.com) and I’ll include it in a future post (if you wish). In return, I’ll enter your name in a drawing for a brand new copy of Ray Bradbury’s Something Wicked This Way Comes. If I receive more than 10 stories, I’ll give away two copies*, in honor of the new All Hallow’s Read tradition. I’ll announce the winner(s) on Monday, October 24, 2011. *I couldn’t find an e-book version, so winners will have to give me an address. This entry was posted in Authors, Books, Ruminations and tagged Halloween, October, Ray Bradbury, Something Wicked This Way Comes. Bookmark the permalink. I would be a Cossack. At the time, I wasn’t sure what that was, but it was obviously someone who wore baggy velvet slacks (cut down from an old pair of my mother’s) tucked into black goulashes, with a white blouse and a red sash that tied around the waist with long tails hanging down the side. The next day we went to the commissary to get the ingredients needed to assemble our treats. Mom unpacked boxes while I sat at the kitchen table and filled orange Halloween napkins with candy corn, miniature candy pumpkins, and salted peanuts, carefully tying each hobo-pack of goodies with black yarn. These were deposited on a newly unearthed cookie sheet for easy distribution to all of the beggars who would come by. And then it was The Night. I was a fantastic Cossack. I know because my dad told me so. I went out to join the horde of potential new friends that moved from house to house, a small group of ignored parents trailing behind. We yelled “Trick or Treat” and held out paper bags for treats and laughed and sweated in the less-than-Fallish Alabama night. “Run away,” called another and soon the whole group took up the chant and I – ran away. After another two blocks, Dad collected me and we went home where I poured out my bag on a clean sheet on the living room floor so we could all admire all the loot I’d collected. Mom gave colorful descriptions of all the costumes that had come by our door. And then it was time for bed where I knew whatever house I was in, I’d be safe from any evil that might be abroad on Halloween night. The next morning I ate breakfast – pancakes shaped like dinosaurs and hearts – sitting on a high stool at a breakfast bar. From that angle I could see the top of the refrigerator, and there, still marching in their orderly rows, were all the napkins I’d so carefully filled, the treats for the children who had run away. I didn’t mention it then, and I never have, but ever since The Night of the Cossack, I’ve been sure Halloween really celebrates family and all the little lies that love can tell. This story is true. For another not-scary, fictional tale that was in the Halloween issue of E-Scape, edited by the incomparable Marie Loughin, go to http://www.meredithsimmons.com and look under the “Story” tab. Great story, Merry! I’m guessing it was the previous resident of your house that turned the hose on neighbor dogs. And then you got all the leftover candy. As for The Naming of Things, I remember that story well and fondly. I’m glad to see it again. I can’t access my E-Scape files. They’re all on zip disks, which I can’t read any more. Oops. Aww…it’s a 2D version of a 3D Extreme Jack-0-Lantern! Well done. Hmmm…would you settle for being Peter S. Beagle? Because his new story “Underbridge” in Ellen Datlow’s urban fantasy anthology “Naked City” reminds me a lot of you. Trigger warning for kitty endangerment. Not sure what you mean by 2D. 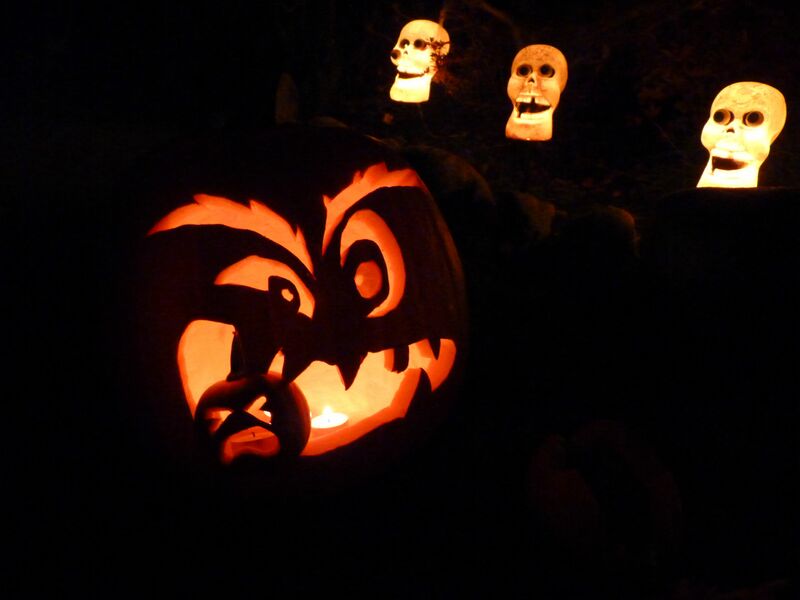 That there Jack-o-lantern was carved from two genuine 3D pumpkins. Ahhh…I just remember the cover from “Extreme Pumpkins” which featured 2 3D pumpkins, so I thought Hannah had carved a 2D version of it. Photo makes it hard to tell. Still, well done. Yes, “Underbridge” features a troll, but no, there are no goats involved. Rats, pigeons, cats and dogs, yes, but no goats. 😉 The story reminds me of you because the character Cut and Shoot is a bit like your Jungle Jim; the supposed derelict who’s actually a guardian of deep mystical secrets. Plus, there’s a lot of academic wrangling that I’m sure you and Tom would be familiar with, and a little surprise shout out. OK, no more spoilers. Happy Halloween! The folks in the big house on the corner of Lucerne and Kreswell had the most popular Halloween stop. It was always one of the first houses we headed to begin filling our loot bags – what if they ran out?! Kids came from miles around for candy (or sometimes) caramel apples. They must’ve spent days and day making hundreds (maybe thousands?) of apples every year. It was a special treat – you couldn’t buy candy apples at the grocery store back then. So it was always something I looked forward to every October 31. I have similar memories of popcorn balls. Sadly, now you can’t hand out home-made treats. Not unless you hold them back and give them just to the kids you know.